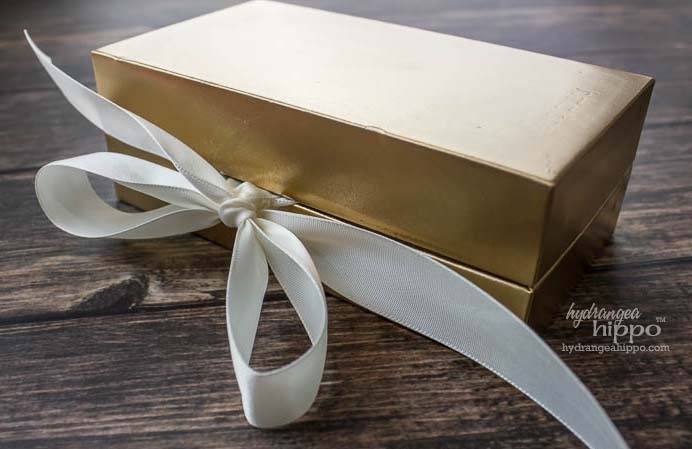 If you travel a lot, you might know how hard it is to find a great travel jewelry box. 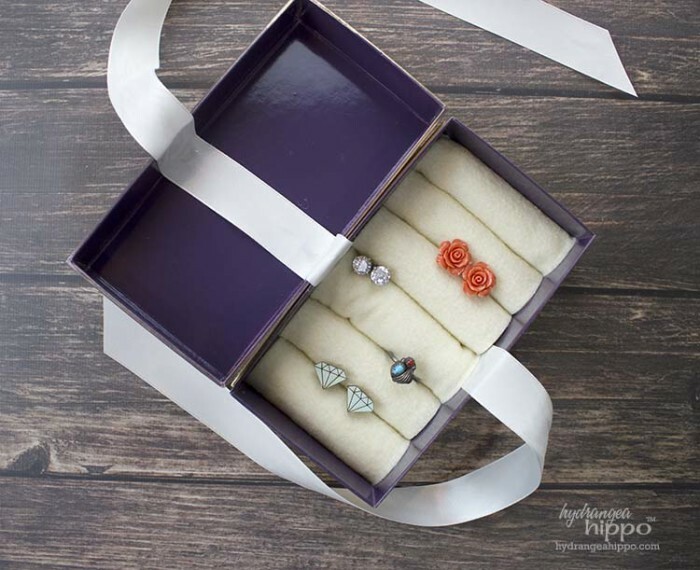 I am a big fan of upcycling so when my husband was cleaning out his office and found a couple of old empty cell phone boxes, I knew what I was going to make: a DIY travel jewelry box! 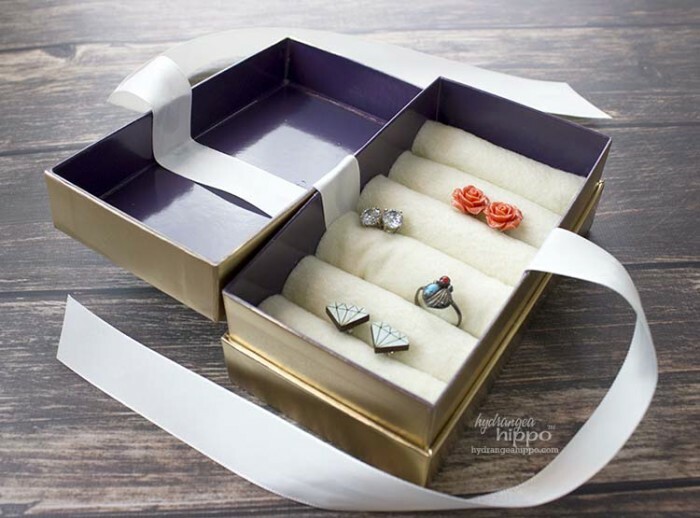 This handmade jewelry case can be used as a DIY gift box, to organize jewelry at home, or as a travel jewelry box. I created this project for the Craft Lightning craft challenge to create recycled crafts, hosted by Creative Green Living. Craft Lightning is a week of crafts that you can make in 15 minutes or less, hosted by Country Chic Cottage and 30 Minute Crafts. This project has two angles on recycling: I'm upcycling a mobile phone box but also using felt made from recycled plastic bottles on the inside of the box. It's like a recycling double-whammy! Add handles to the sides of the lid and create a tray. The bigger the box, the better! To create this box, you'll need a few basic supplies you might already have around the house. I used specific colors of spray paint and other supplies but you can use any colors of spray paint, felt, and ribbon you like. I recommend spray paint over say, acrylic paint, because spray paint is fast and dries with a nice, smooth finish. I also chose to use Kunin Rainbow Classic felt made with Eco-fi,® a high-quality fiber made from 100% post-consumer recycled and BPA-free plastic bottles, upping the “green” factor on this box even more! I know, spray paint is not the MOST eco-friendly paint option but spray paint manufacturers have come a long way in the last 20 years. Krylon offers advice on their website on how to best recycle used aerosol cans and well as shares their sustainability plan. The embossed logo of the cell phone company is still somewhat visible on the box lid. You can choose to cover this with rhinestones with paper. I decided to leave my box as-is because I wanted it to be sleek and easy to pack. I hope you're inspired to see “trash” in a new light as full of possibilities for crafts and as solutions to common problems. 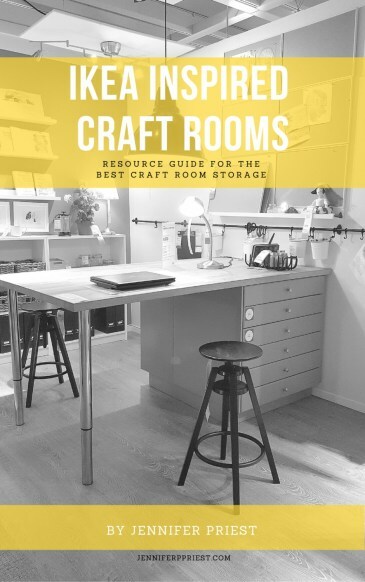 What do you recycle to make crafts from? Leave me a comment about what you've created and feel free to include your links. So awesome Jennifer! Thanks for joining! Thanks! Glad to be a part of it 🙂 Now I need to check out what everyone else made! Hi! I’ve been saving these boxes! They are so cool and just to well made to throw away. I’ve been trying to come up with ways to alter them. Plus, my husband has 2 cochlear implants and the boxes for the implants would make awesome shadow boxes. Thanks for all of the ideas. Would really like to give it a go! This is SUCH a fabulous idea! What great Christmas gifts, too!! Thanks so much for sharing this wonderful way to re-use too-good-to-throw-away small boxes.